Bob's experience in networking began in 1980, well before the TCP/IP protocol had been created. In those days Bob had to design and implement the communications protocols just to be able to transfer data from one computer to another. In 1987, while at Los Alamos National Labs, Bob was using the Internet in its earliest form, one that at that time only a few engineers were even familiar with. It wasn't until 1993 just after the release of NCSA's Mosaic, the very first graphical Web browser, along with a growing ease with which average computer users were utilizing email, that Bob grasped the significance that the Internet and its potential benefits would have to businesses then, and into the future. 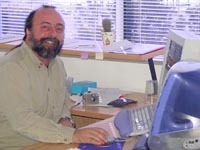 By late1993, Bob had built a consultancy helping businesses to get connected to the Internet. Having been trained as an engineer, Bob is quick to ascertain the optimal way to approach a technical problem. He adheres to the basic motto that "if a job is worth doing, its worth doing well." In fact, it was Bob's frustration with unreliable and poorly engineered solutions offered by other providers that drove him to found DigiLink. With the new user friendly, multimedia rich web browsers, he knew that dial up modems just wouldn't cut it. Modems were inherently slow to connect, slow to move data due to latency and overhead, and unreliable. He knew the proper approach would be to utilize digital technology end-to-end. So he immersed himself into the field of digital data communications, and soon earned a reputation as a respected vanguard in these types of solutions. "I realized the medium was going to be huge," says Bob, "so I developed an understanding of what was required to bring the technology from the technical world of engineers and geeks to the everyday business." Originally, Bob would architect solutions that utilized services from existing ISPs, but he soon realized that the only way he was going to be able to guarantee a quality solution was to deliver it himself--existing providers simply didn't have the expertise or reliability. So in 1994, he founded DigiLink, a company focused exclusively on digital internetworking solutions for business. He set about engineering an extremely high-performance core network, and built a team of professionals to provide the requisite support to the network and DigiLink's rapidly growing customer base.